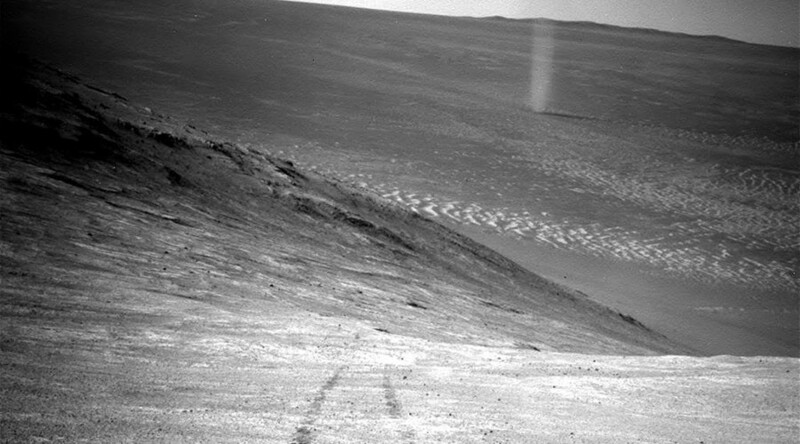 An impressive, albeit somewhat eerie, picture of a dust devil whirling through a valley on the surface of Mars has been captured by a NASA rover from its perch high on a ridge. The photo shows the six-wheeled robot’s tracks in the foreground, leading up the north-facing slope of "Knudsen Ridge", which forms part of the southern edge of "Marathon Valley". Meanwhile, the dust devil can be seen twisting in the background. While dust devils are common on Mars and have been caught on camera by NASA’s other rover, Spirit, the Opportunity (MER-B) rover had not been so lucky in spotting the red planet’s twisters. This sighting was recorded on March 31 during the 4,332nd day of the rover’s mission on Mars. Opportunity landed in Meridiani Planum, located 2 degrees south of Mars' equator in 2004, three weeks after its twin Spirit (MER-A) touched down on the other side of the planet. Spirit ceased communications in 2010. Dust devils are also common on Earth and are formed when a rising, rotating column of hot air whirls at speed, picking up tiny grains of dust from the ground in the process, making the vortex visible. On Mars, however, stronger updrafts are needed to create the dust devils, which tend to grow bigger than their counterparts on Earth.